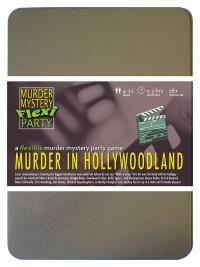 You've been invited to play the role of SHERLOCK UPYODAUGHTERS in Murder in Hollywoodland. You're invited to a star-studded yacht party, as Lucas Cameronburg is shooting the biggest blockbuster ever made! But before he can say "That's a wrap! ", he's hit over the head with his Goldguy award and pushed overboard! Join us to find out who cut Cameronburg from his own film! No one dresses quite like the inimitable Sherlock Upyodaughters. With your rakish deerstalker hat, embroidered waistcoat, loosely tied scarf and dark overcoat you blend seamlessly into any crime scene. A teasing puff on your pipe sends the women wild whilst your piercing stare and enigmatic half-smile does the same for the men. At an early age you realised you were more observant than your average peer. However, this turned out to be a boring hinderance, so although you rapidly ranked up through the police force you started using your powers of deduction to woo women instead. As you’ve grown older, you’ve turned to using drugs, dulling your senses for more of a challenge. For those of you with terrible powers of deduction, I am indeed no other than Sherlock Upyodaughters. Already in this room I have spotted someone who hides their Bavarian descent, an ex-scout leader, a woman who used to be a man and a man who used to be a dog. And at least two people I’ve had conjugal relations with. I already know who killed the esteemed director, but I shall have further pleasure watching those less fortunate figure it out. Just to make it more interesting, I’d like to point out that I’m particularly good at clubbing people over the head, and was in the vicinity of the murder at the time. Ergo, I am a suspect. I’m also under the influence of several banned narcotics, to level the playing field, of course. Finally, has anyone seen my pet ferret Watson? I like stroking his hairy body while I’m thinking.